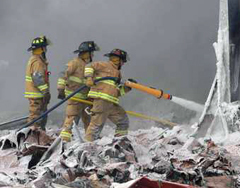 More than a hundred firefighters from 30 companies in Wisconsin and Minnesota have been on the scene of the fire at the St. Croix Storage and Transfer warehouse since 11:00 Thursday night. Parts of the 100-thousand square foot warehouse were built in the 19th century to house railroad car repair shops. River Falls Firefighter John Jensen says so many firefighters are involved because of the size of the fire and the weather – with temperatures around 5 below zero at the start of the fire. White Bear Lake Minnesota fire chief Paul Peltier says firefighters and equipment were rotated in and out of the area. Water that was sprayed into the fire condensed in the form of icy rain which caused slippery stretches on State Highway 35 during morning rush hour. The highway was kept open. John Schommer once owned the warehouse and was instrumental in efforts to get the property on the National Register of Historic Places. "It&apos;s probabley one of the most depressing days of my life, " said Schommer. Hudson Fire Chief Jim Frye expects firefighters to remain at the scene into Saturday morning.